You started thinking about this weekend from the moment the last one ended. We did too, and we created a basket to help you celebrate. 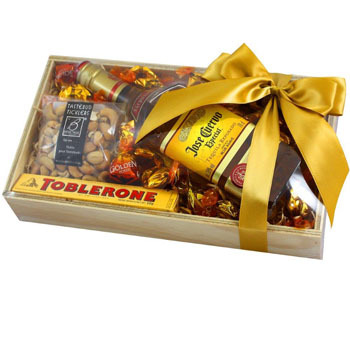 Your recipient will receive a bottle of high quality Tequila, along with salted Cashew Nuts, a satisfying Chocolate Bar, tempting Chocolate Hazelnut Bonbons, creamy Caramel Toffees, and more. Prepare for a Birthday, have a special Anniversary, or treat yourself with Time to Party. Please note: The gift may be delivered in a wooden crate, gift basket, or gift box depending on delivery location.